There's a new FISH! in the pond! 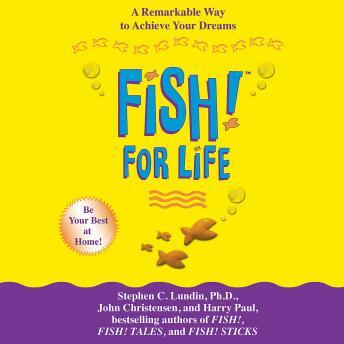 Here's a brilliant parable for everyone who wants to lead a fuller, happier life illions of business people have already used the bestselling FISH! books to improve the way they work. Now, the authors turn their attention to life's daily personal challenges, helping readers deal with them simply and effectively. By applying the FISH! principles of Play, Make Their Day, Choose Your Attitude, and Be Present, FISH! for Life shows readers how to confront life's issues and to reach their full potential. With advice on such life issues as weight loss, personal finance, and relationships, the book is a road map for achieving personal happiness and well-being in all areas of life. After all, life shouldn't be work.